Khadi Herbal Jasmine Massage Oil Review Reviewed by Nikki Mishra on February 15, 2017 . Khadi Herbal Jasmine Massage Oil gives excellent relief against stress, anxiety, muscle pain, joint aches, etc. The product is worth trying! Today, I have come up with something very unique and adorable. Tired of writing about various beauty products, I badly needed a relief from the stress. And guess what, I have got a product that literally helps in stress relief. We have already reviewed some products from Khadi. Herbal products from this manufacturer are often appreciated for their excellent qualities. In this article, we shall discuss another Khadi product – Khadi Herbal Jasmine Massage Oil. Manufacturer says that this herbal oil rejuvenates mind, body and soul, rendering excellent stress relief. At the flip side of the bottle of this oil, it is clearly written that you can apply it to any part of your body. Massage well, and leave it for at least 10 minutes. Sweet fragrance of jasmine will refresh your mind, while the massage oil will improvise your blood circulation process. Key Ingredients: Jasmine oil, Almond oil, Olive oil, vegetable oil, etc. At the flip side of the bottle, usage directions have been provided to the buyers or users. This essential oil is simple to be used. 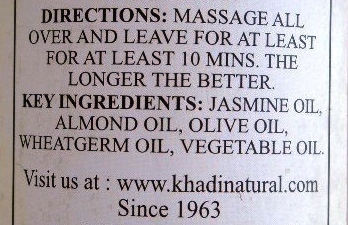 Just take handful amount of oil, and massage all over your body. Leave it at least for 10 minutes, and during this time try to relax your muscles, body and mind. The longer you can do this, the better result you will get. 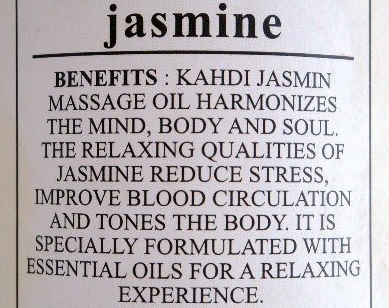 I have started using Khadi Herbal Jasmine Massage Oil very recently. So, many would say it is unjust to review a product that I’m using of late. Well, to be honest, I don’t write a review without being sure of the effects of the product. After using for just two weeks, I have noticed amazing results from this product and that is why I have come up with this review. Let me start with packaging, and honestly it is too simple. I’m not fussy with product packaging. Moreover, all Khadi essential oils or hair oils come with such simple plastic made bottles. There is nothing unique to be mentioned about packaging. Now, let’s hit the money! I use this essential oil at night, especially when I feel really stressed out, after surpassing a hectic day at office. The fragrance of this essential oil is charmingly beautiful. Sweet and authentic aroma of jasmine gives inner peace and mental boost. I do not go for deep massage rather I just go for simple application of the oil on whole body or aching parts of body. If you have a paining back or aching neck or head, apply this oil with gentle or soft massaging. After that, rest on your bed, relaxing your nerves, body and mind. 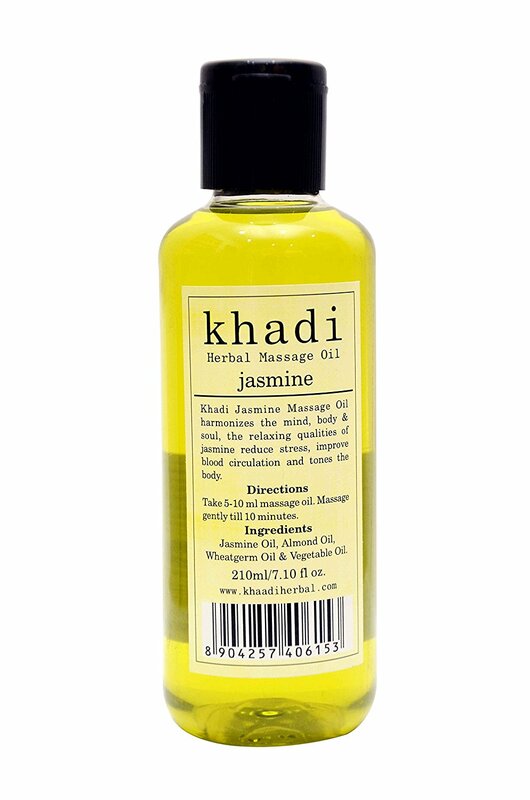 Khadi Herbal Jasmine Massage Oil gives quick and effective relief from stress or anxiety. I would recommend this product to everyone. This is truly worth trying – at least I’m very much satisfied.